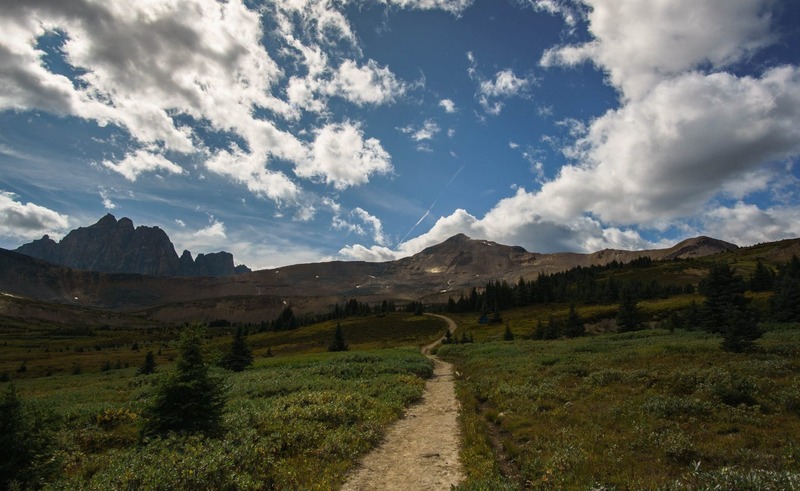 With so many stunning trails and views picking a highlight of Jasper National Park can be a challenge, but hiking in the Tonquin Valley must be a contender. 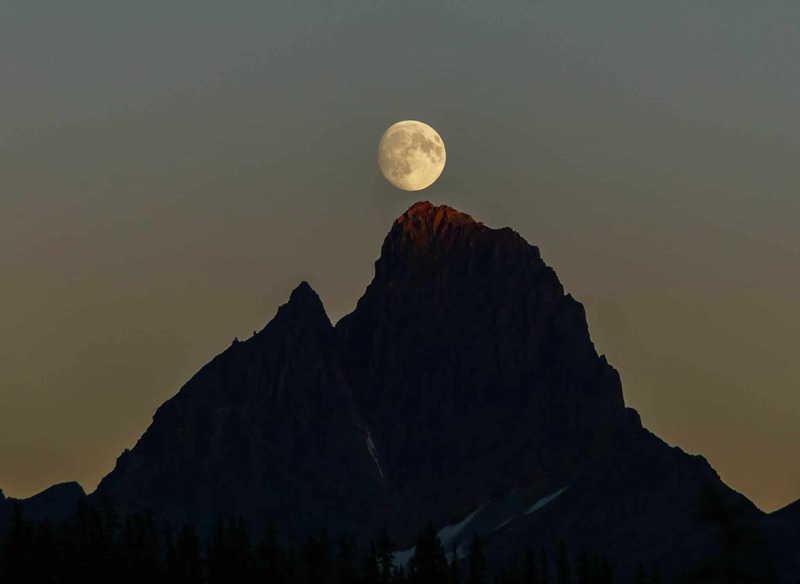 The combination of sky high views of the rugged “Ramparts” range jutting up from serene alpine lakes, and the chance to see rare wild mountain caribou make it as worthy a destination as any. It is also an accessible backcountry trail that can cater to many ability levels and even be trekked on horseback. 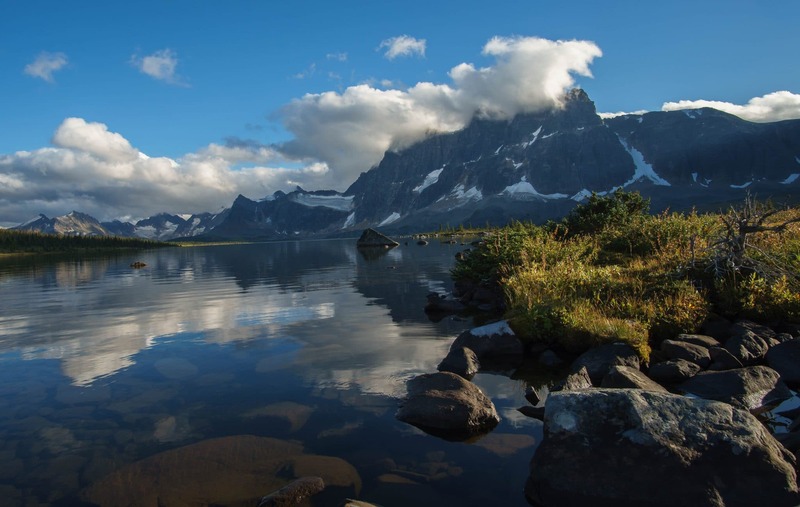 Considering all these factors, it’s easy to see why the Tonquin Valley is a popular area for locals and tourists alike. But it just may be getting a little too popular for its own good. 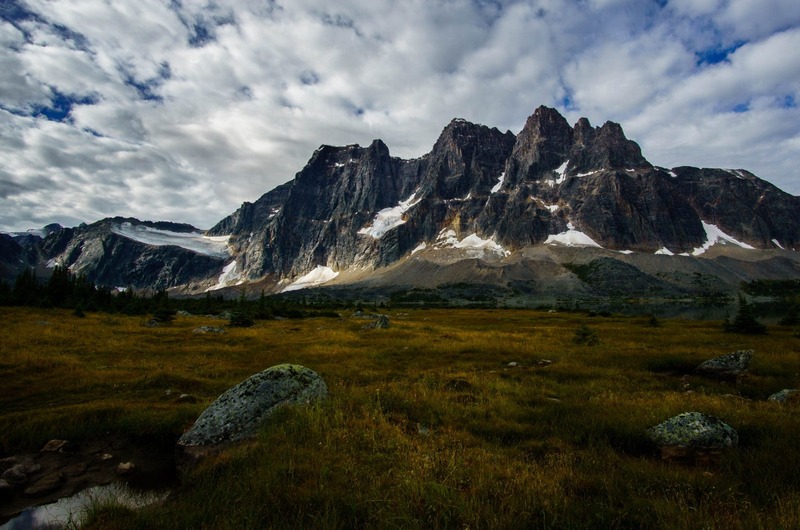 It’s a long hike in to Tonquin Valley but The Ramparts are worth it! Canada is celebrating its 150th anniversary of Confederation this year. I’m reluctant to say “birthday” since the land that is called Canada now has been occupied by Indigenous peoples for tens of thousands of years. Nevertheless, it’s a cause for celebration for many and to mark the occasion, the Canadian government waived entry fees to Canada’s world famous national parks. This has meant record-setting attendance, which may be an economic boon and has introduced thousands to nature and the treasure’s that are our national parks, but it does come with a few drawbacks. Earlier in the summer Waterton Lakes National Park had to close and turn away visitors because it reached capacity for the first time ever. 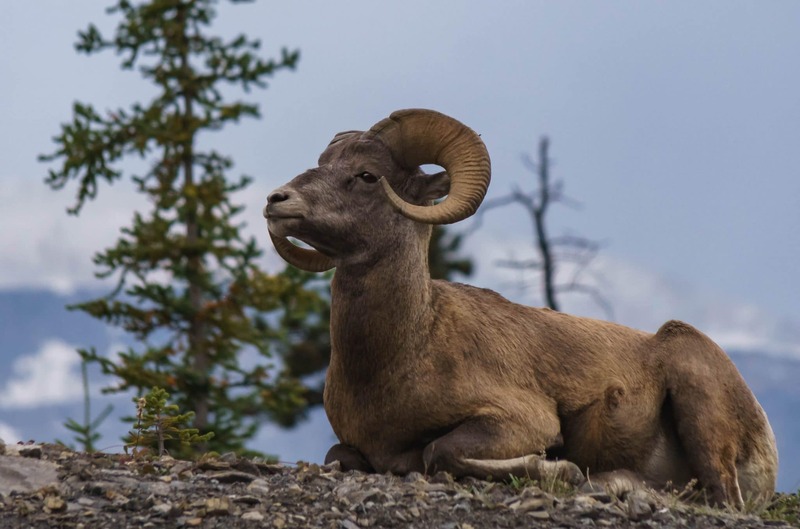 There have also been many examples of tourists behaving badly around wildlife classified as “threatened.” It is great that the more people are gaining exposure to the beauty of Canada’s National Parks but not everyone is rejoicing in the steady influx of visitors to the parks. We anticipated that the National parks would be even busier this summer, but as almost locals* we knew that most of the people coming to the parks would hit the popular sites, posing for pictures in front of Lake Louise and Moraine Lake for Instagram, hiking Johnston Canyon, and paying way too much in underwhelming restaurants. Although popular in non-Canada 150 years, the National Parks in the Canadian Rockies tend to funnel tourists to the same spots, leaving massive wilderness areas for those more in the know to explore with less crowds. This approach has worked for us in the past, but some of the farther afield trails seem to have become too popular for their own good. 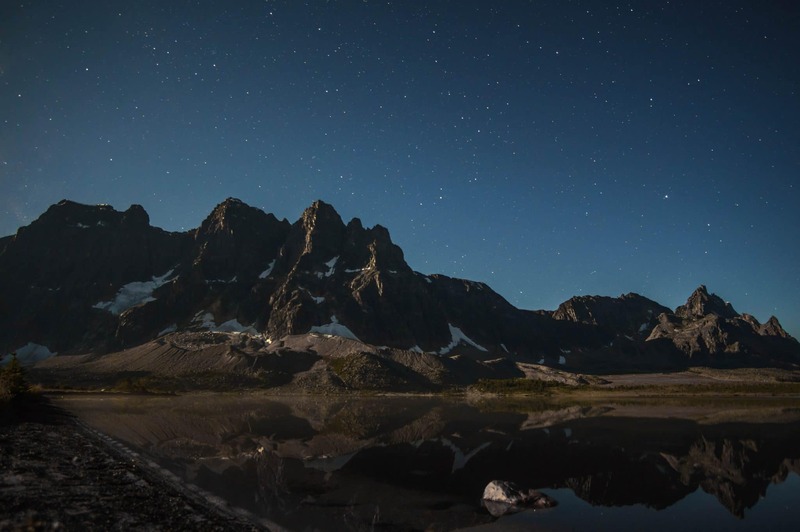 Nowhere has this conflict between popularity and preservation of a precious space been more apparent than when we went backpacking in Tonquin Valley. *I say almost locals because as of yet we only live close to the mountains, rather than in a mountain town. While it’s disappointing, I am also not surprised to see heaps of trash at popular roadside attractions that require less than a kilometre walk in. But I do not expect to see this same disrespect for nature on a backcountry trail. When you have a long hike in to a destination you expect the users of the trail to have a bit more experience and respect for the area. Indeed, Jasper’s majestic Tonquin Valley may be in the process of being loved to death. Farther from a major city and airport than Banff, Jasper National Park has always provided a more rustic and real mountain experience. This authenticity has made it very popular with people from places that have long since ploughed their forests in place of cottages and cities, and rendered their native predators extinct by replacing their habitat with one friendly only to farm animals. 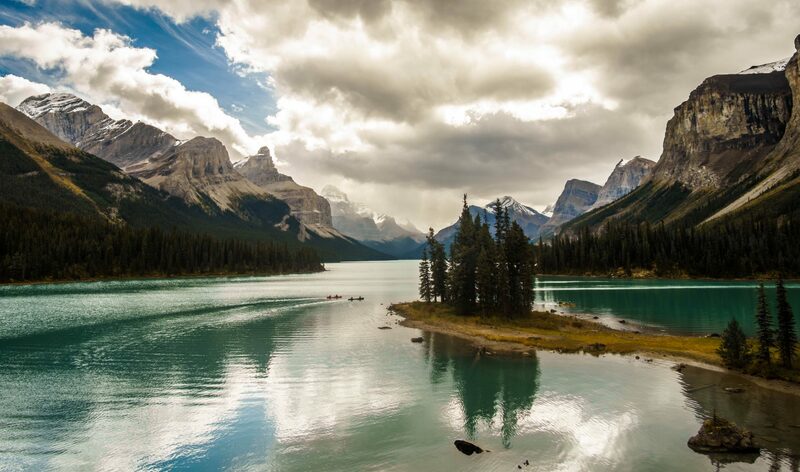 Drawn to the appeal of wilderness and wild animals in their natural habitat, people arrive in droves to Jasper seeking that perfect combination of all good things wild and free. Which is fine in principal, it’s what we do here at Zen Travellers, but if you read the blog you’ll know that we are firm believers in travelling responsibly. That means leaving a place better than you found it and we found that many visitors were not doing this in Tonquin Valley. The following is some advice for how to hike in Tonquin Valley responsibly. The hike itself is long but extremely straightforward and there’s little opportunity to get lost like we did when backpacking on Northover Ridge earlier in the summer. The trail is wide and well defined due to the erosion of many boot prints and hooves. Amethyst Lakes and a view of The Ramparts are the main highlight and if you’re lucky, you’ll catch a glimpse of an endangered caribou as they frequent the area. Trailheads for the hike are at Astoria Creek and Portal Creek. 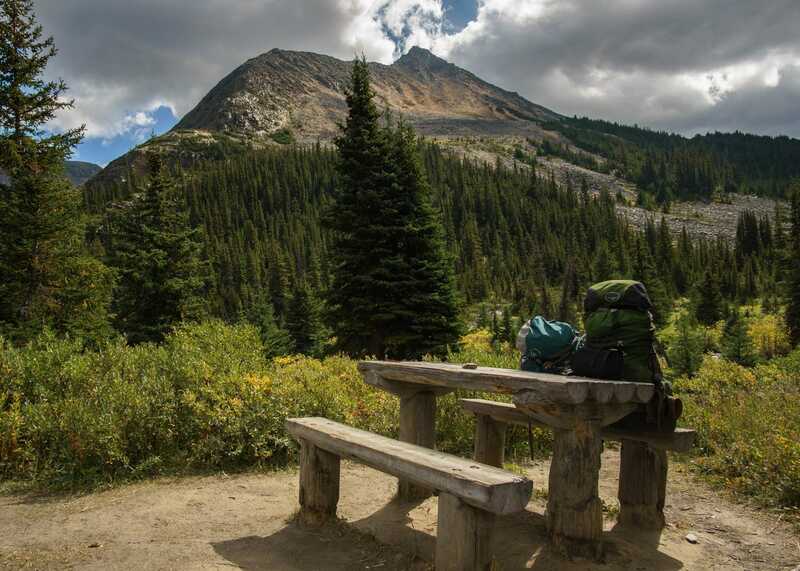 Parks Canada has an excellent overview of the campsites and directions to the trailhead on their website. The Astoria Creek trail is considered easier as it is a bit more direct and has a more gentle elevation gain but the Portal Creek version of the trail offers more views in exchange for a bit more effort, especially as you crest Maccarib Pass. The hike is typically done as a point to point hike or loop, in which case you’ll need to either arrange a shuttle for your car. If you only have one vehicle, park your car at the Portal Creek Trailhead and arrange for a taxi to take you to Astoria Creek (there is cell service at the Portal Creek trailhead). We saw quite a number of parties doing this and it does allow you to get a bit more variety in the terrain covered. If a shuttle sounds like too much trouble, whether you start at Astoria or Portal, go to Amethyst Lakes and turn around and go back the same way you came in. The Ramparts. These are seriously impressive mountains. Spoiler Alert: We have more than a few pictures of them to share! Tonquin Valley has a reputation for being muddy and having a lot of bugs so it is best to wait until later in the summer to give the trail a chance to dry. Typically late August and September are the ideal times to hike the trail. Portal Creek trailhead is open year round. Cavell Road and access to the Astoria Creek trailhead is typically open from mid-June to mid-October. In the winter Cavell Road is closed until February 15th winter to protect caribou, after this point the trail is tracked for cross-country skiing. We hiked it over the September long weekend in one of the driest summers on record so we lucked out and didn’t see a whole lot of the two pests this trail is famous for – mud and mosquitos. We opted to do an in and out via Maccarib Pass as the main highlights of backpacking in Tonquin Valley are Amethyst Lake and the stupendous views from Macarib Pass which you must travel through to get there. Once you gain the elevation to get to the Pass, the views of high alpine peaks, including the appropriately-named Majestic Mountain, flanked by meadows and transversed by streams are a sight worth beholding twice. Taking this route made for two long days (about 23km each) so we opted to spend two nights at Amethyst Lakes and enjoyed a more relaxing day doing some day hikes around the lakes and taking many photos of the Ramparts in different lighting. Hiking through Maccarib Pass. The Ramparts just barely poking through on the left. We spent the night in Jasper beforehand to get an early start and parked our car at the Portal Creek Trailhead along the Marmot Basin road. Once there, we put on our trusty osprey packs and prepared for a long and tough 23km into Amethyst Lakes. Those with more time or who would like to do less kilometers each day could camp one night at Portal Creek campground at 8.5kms in or at Maccarib campground at 20kms in. The first portion of the trail is in thick, mossy woods that parallel a loud rushing stream (portal creek). With berries on the side of the trail this is prime bear habitat. Parks Canada and my two separate bear awareness training courses will tell you that the best way to prevent a bear encounter on the trail is to be loud. Ideally, the bear will hear you and move off the trail and if you’re lucky, you’ll catch a glimpse of him as he scampers away. Surprising a bear on the trail is NEVER something that you would want to happen since they can behave aggressively in response. Very rarely, but a reality nonetheless, surprised bears have attacked people in the past and more often than not, a bear that has attacked a person by doing only what nature has programmed it to do gets destroyed in order to protect people. With this in mind, we talked loudly as we hiked along the first portion of the tail into Amethyst Lake campground. Our talking evidently wasn’t loud enough because as we rounded a bend, I saw a black bear feeding in the bushes not more than 25 meters away from me. Startled, I shrieked loudly which in turn startled the bear. It looked up from its munching as we backed away back around the bend while getting our bear spray ready. The roar of Portal Creek (not moving too fast here) masks your sound, increasing the risk of startling a bear. We had recently passed two other hikers so we waited for them with our bear spray out just in case. As they approached, we warned them that there was a bear on the trail. Rather than being cautious, they seemed excited and eager to encounter the bear. We told them that Parks Canada advises that you hike in groups of four in bear habitat and that we should proceed together while making lots of noise. They agreed to walk forward with us and were thrilled when the black bear hopped onto the trail then paused to take a good look at us before running across the stream into the woods on the other side of the trail which was the best possible outcome in that situation. We learned that the couple were visiting from Germany, a place whose native bears have been extinct for hundreds of years. “it’s only a small one” said the man while his partner gushed about how cool that encounter was. “And black bears don’t really attack people anyway.” he added. Wrong. Wrong. Wrong. (These are 3 examples of black bear attacks just from this year!) He then decided we were hiking too slowly for him, so he informed us that they would see us at the campground so he and his partner could continue to hike on silence through bear habitat. Black bears, even small ones, have attacked and even killed people in the past. While these attacks may be rare, it’s important to remember that if that happens, the bear often gets put down as a result. So in other words, it is in everyone’s best interest for bears to have a healthy fear of us and for us to have a healthy respect for them. This means preventing rather than wishing for bear encounters on the trail. Grizzly bears are majestic creatures and you can consider yourself lucky if you see one, but it’s best to see them from the safety of the car. 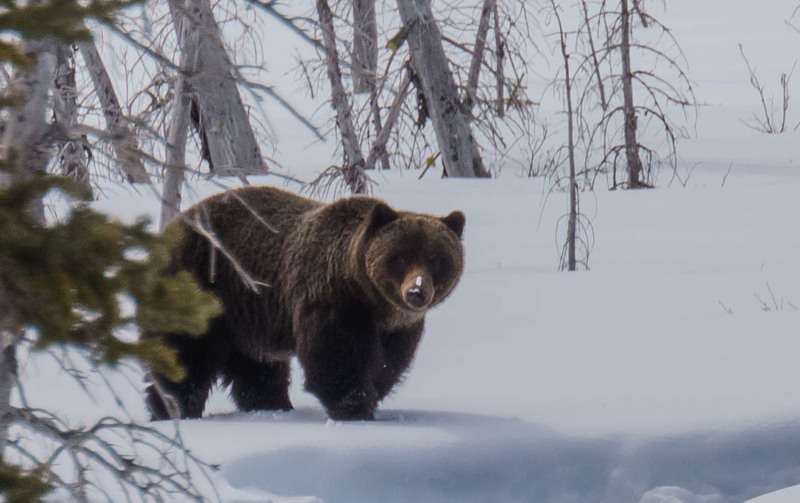 This grizzly was a couple kms away and the photo was taken with a zoom lens and heavily cropped. Sorry everyone, the only safe way to see a bear is at a distance and preferably from inside your car and only if you’re so lucky. Luck is how we look at it. If we’re lucky enough to see one of those incredible animals from afar during our adventures, we are just that. If we are seeing one in person up close, then we are concerned with the outcome for both ourselves and the bear. The last thing we want is for our leisure activities to result in a bear having to be destroyed. So if you are visiting bear habitat, please keep in mind that when human an bear encounters occur, it is often worse for the bear. Travelling responsibly means respecting local wildlife and that means preventing close encounters with bears. Alright, now that we’ve made ourselves clear on the bear front, let’s return to the beautiful Tonquin Valley Trail. After about 4km in the woods, the trail opens up to rocky outcrops and begins to climb more steadily. After about 8.5km, you will arrive at Portal Creek campground (the site of a fatal bear attack) which is a good place to stop for lunch. From here you will climb steeply to the runner up in highlights of this trip, Maccarib Pass. Maccarib is an Indigenous word for caribou so keep your eyes peeled for caribou, you are in their habitat now. Once you reach Maccarib pass, be prepared to spend the next hour or so of your life in a steady state of awe. The views from the pass are simply incredible. Few trails take you up to treeline so quickly and afford you such splendor with relatively little effort. Getting to the Pass takes some work, especially with a heavy pack on, but it is no scramble or Northover Ridge. It’s a relatively straightforward trail that climbs steadily with only a few steep sections. Proceed along the picturesque valley for some time and soon the Ramparts will begin to come into view. Before they reveal their true splendor at Amethyst Lakes, you will descend again through to Maccarib Campground which would be a good place to stop if you’re not as much of a glutton for punishment as we are. It would be a beautiful place to camp and it’s only an easy 3-5km to Amethyst Lakes. Speaking of distances, between Skyline, Iceline and this trail, we’ve noticed that there are differing reports for distances between what we read on the internet and what is on the signs on the Parks Canada trails. The signs seem to underestimate distance while the internet assigns the trails a few more kilometers. This might not seem like much, but when you’re tired and hauling a big backpacking bag on your shoulders, an extra 3-5km are not always welcome. That being said, if Parks Canada would like to hire us to visit these beautiful areas and confirm the exact trail distances sometime, please be in touch. So after Macarib Campground, you will proceed a distance between 3 and 5km to Amethyst Lakes mostly though forest. 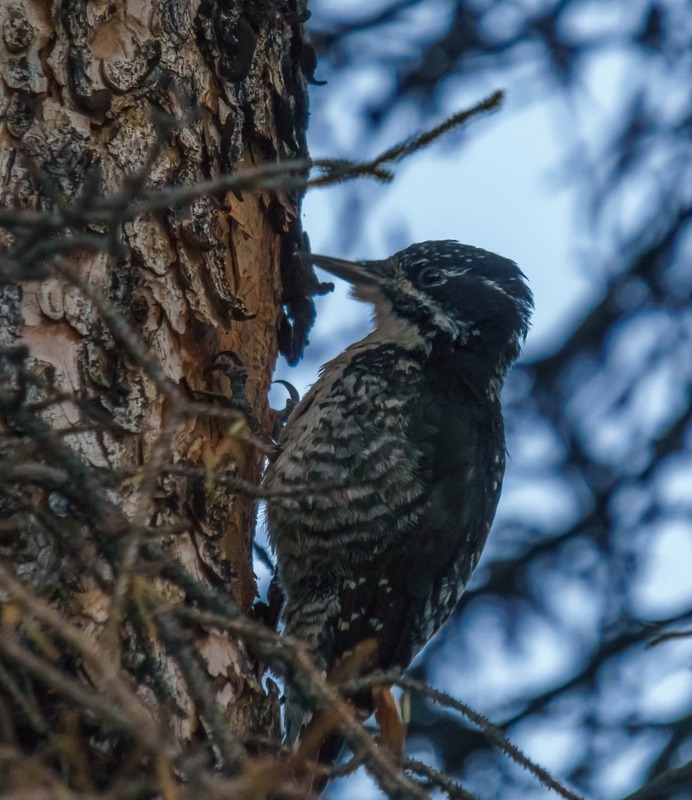 Keep your eyes peeled for boreal chickadees and the uncommon American three-toed woodpecker. We saw one boring holes and dispatching bark off trees with incredible grace as they’re prone to do. Soon the Ramparts will come into view opposite the shores of Amethyst Lakes and you will understand why you walked that long and far. This is a sublimely beautiful place to pitch a tent. 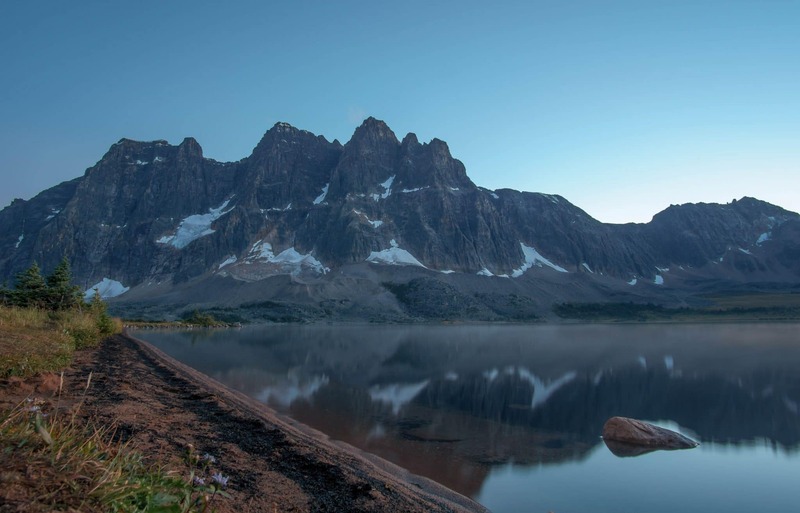 With panoramic views of lakes and glaciated peaks framed by sprawling meadows that occasionally host rare woodland caribou, Amethyst Lakes is the ultimate destination in the Tonquin Valley, and Macarib Pass is the best way to get there. While hiking 23 or so kms in may not be the path of least resistance, it is the most rewarding in terms of views and terrain. The stunning Amethyst Lakes are made from glaciers melting off the nearby peaks and you can hear the icefields cracking and shifting as they go through their summer thaw. If you’re lucky, you may even see a chunk break off and crash into the lake! We set up our tent, ate some dinner, and hunkered down for a night of much-needed rain. In the morning the weather cleared for a spell so we spent some time walking around the lakes and exploring the area after breakfast. I can think of worse places to spend the night! The lakes are by far the highlight of the trip and from the campground you can hike southeast toward a beautiful meadow where we saw the tail end of some caribou grazing in the meadow. Quite literally, all I saw was their butts through my binoculars as they returned to the forest from the meadow. From this meadow you can also get a closeup view of Mount Clitheroe and some of the glaciers on The Ramparts. Another hike that is accessible from Amethyst Lakes campground is Moat Lake. We had asked some fellow campers who had done that trail the day we arrived what they thought of it and they said the trail wasn’t very nice and it was easy to lose, but the lake itself was very beautiful, so worth the effort in their view. We aimed to do it on our second day camping at Amethyst Lakes, but it rained again so it was late in the afternoon when we attempted it. We did indeed lose the trail just like the other couple and once we found it, could see that the lake was at least another 5km or so away. We weren’t sure if we had enough daylight left to finish it before the sun went down, so we started returning to the campground. While Moat Lake looked beautiful from afar, I’m not convinced that it could rival the Amethyst Lakes and their Ramparts backdrop. One cool thing about the lake though, is that if you were standing on its shores having accessed it from Amethyst Lakes, you would be in Alberta looking into British Columbia where the lake ends on the other side. On the way back to camp, we found a different trail that we would highly recommend if you’re staying two nights at Amethyst Lakes. We never learned its name, but it branches off the trail in Amethyst Lakes at the same spot as the trail for Moat Lake. Unlike the latter, it is easy to follow and is waymarked by round yellow disks. Follow these through a meadow and eventually you will come to a beautiful pond that provides a different angle on the ramparts. There was a family of gold eye ducks paddling around the pond and we could hear the Lake’s resident loons calling in the distance. The pond is only about a 5-6km roundtrip trek from the campground which would give you lots of time to do both this small hike and to explore the meadow at the other end of Amethyst Lakes where we saw the caribou. We recommend this instead of an arduous 16km to Moat Lake to see views that are unlikely to rival those at Amethyst Lakes and Macarib Pass. That being said, if you’d rather hike in a circuit, you could carry on to the Clitheroe or Astoria campgrounds to finish on the Cavell Road. Taxis will pick you up at either trailhead and deliver you to the opposite one to start your hike. Since we were doing an out and back hike, we didn’t find out how much that costs. If you’ve done the taxi shuttle please comment and let us know! The overriding principal of any travel in the backcountry is “leave no trace“. 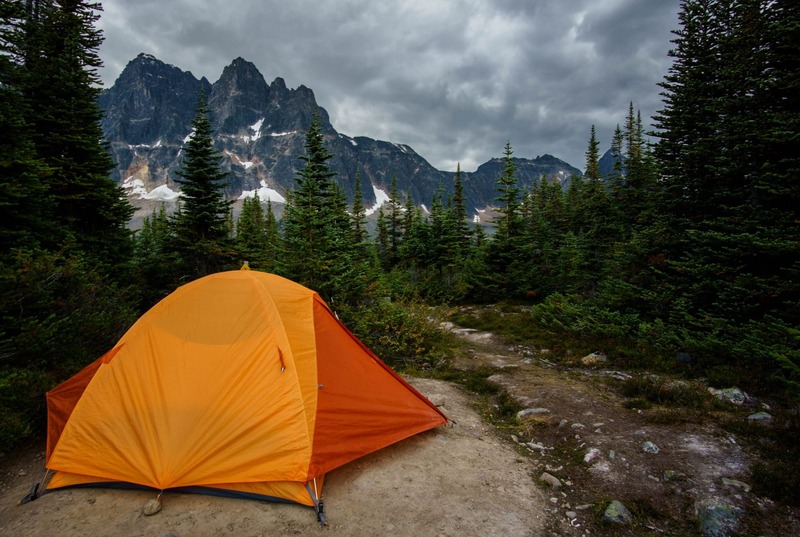 This means backcountry users are expected to pack out all that they bring into the campground and trails (yes even toilet paper, yes even pistachio shells which were littered around our Aster Lake campsite on Northover Ridge) and respect the laws of the land. In the case of the Tonquin Valley, this means no fires in the backcountry, no dogs at the campsite to not disturb the caribou, and of course, to respect the principals of leave no trace. Unfortunately, it seemed as though many people did not adhere to the backcountry code both on the trails and at the Amethyst Lakes campground. Of all the backcountry camping we did this summer, this one was by far the worst. Instead of replacing the backcountry toilet’s barrel like you may have to do sometimes because Parks Canada does not fly employees up to swap out the barrels when they’re full, campers just complained that the toilet was gross. They then proceeded to treat the surrounding area like their own wilderness toilet, leaving toilet paper strewn all over. This is not consistent with “leave no trace” principals. Pack an extra ziploc bag for this specific purpose, and don’t leave your trash all over a National Park. If the toilet is gross, change it! It’s not that hard, we’ve done it twice. We all need to do our part to look after the campgrounds. Turning a backcountry campground into one big outhouse is bad enough, but we also found recent evidence of people lighting a campfire which is prohibited in the Tonquin Valley. This summer has been one of the worst ever for forest fires and the risk of starting one from something as careless as a campfire in the campground was higher than ever. We are all responsible for protecting these precious areas. There was already a wildfire burning near Banff National Park and while we were hiking in Tonquin Valley, another one started in Waterton Lakes National Park which lead to the evacuation and closure of the park. In short, the rules that Parks Canada puts in place on its trails are there for a reason. As if the previous peeves weren’t enough, there were food wrappers floating in the streams and strewn along the trail. We did our best to pick as much as we could up, but we would rather people take responsibility for their own impacts. Responsible backcountry use ensures a habitat for cute little marmots like this guy that we saw by Amethyst Lakes! Food wrappers, toilet paper and tea bags all constitute leaving a trace. Tourists wouldn’t be happy if people showed up and dumped garbage all over their backyard, so they shouldn’t do it here. 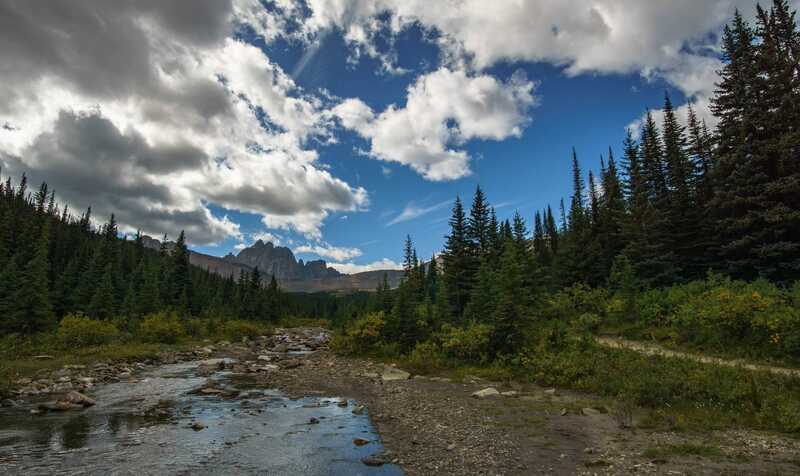 The Tonquin Valley is a spectacular wilderness and being able to use it is a tremendous privilege. 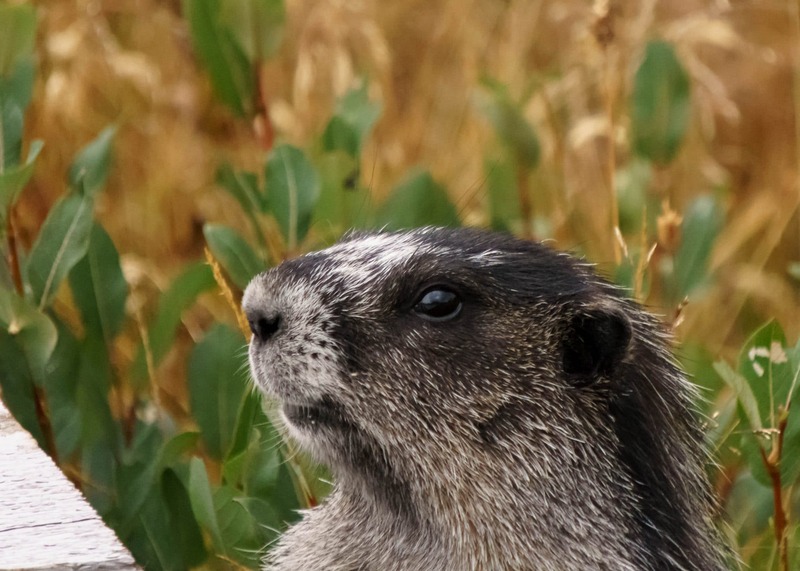 Being careless with our impacts when travelling through this fragile alpine ecosystem puts access to it in jeopardy for others, and more importantly, may cause harm to the animals that call it home. Each visitor to the area is responsible for leaving it as good or better than it was before. You will need to book your campsite ahead of time and the campgrounds can fill up fast. If you’re flexible with your dates, you can always check closer to the day. Reservations are made here. The Wates-Gibson Alpine Club of Canada Hut is in the area as well and you can book that here. The trail is famously muddy, so you may want to wear gaiters. Also it’s covered in horse crap, so gaiters are starting to look pretty good. The bugs can be really bad too but by the end of August/Early September, they should have calmed down. There are two outfitters if you’re interested in doing some horseback riding or a more luxurious place to stay than a tent. Tonquin Valley Backcountry Lodge and Tonquin Valley Adventures. Never underestimate how cold it can be in the Rockies at night, especially once you add in some elevation like at Amethyst Lakes. We woke up to our orange tent having been turned white by frost! Bring all the warm layers you have. There are frequent sources of water along the way so you’ll never have to worry about being without it for too long. You will have to filter or disinfect it though. Again, this is bear habitat, so make lots of noise, pack all your food items out with you, and carry bear spray. Again, leave no trace means packing out all that you packed in, yes even toilet paper. To conclude, the Tonquin Valley is an excellent area for everyone from people just learning to love the backcountry to seasoned alpinists alike. From the many campgrounds along the way, people can make a base for loftier pursuits like summit attempts and glacier travel. 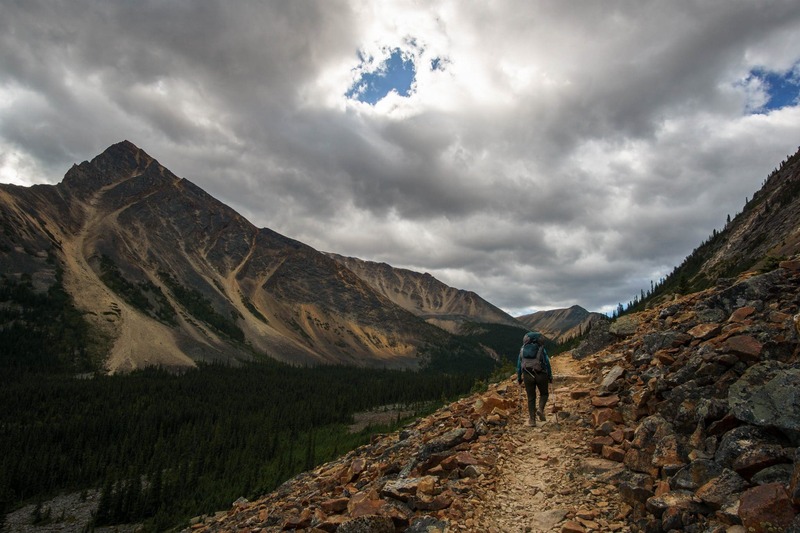 For those looking for a rewarding and only slightly challenging hiking experience, we recommend hiking through Maccarib Pass to Amethyst Lakes campground, where the views will stay with you long after you’ve left and where you may even get to see an endangered caribou. 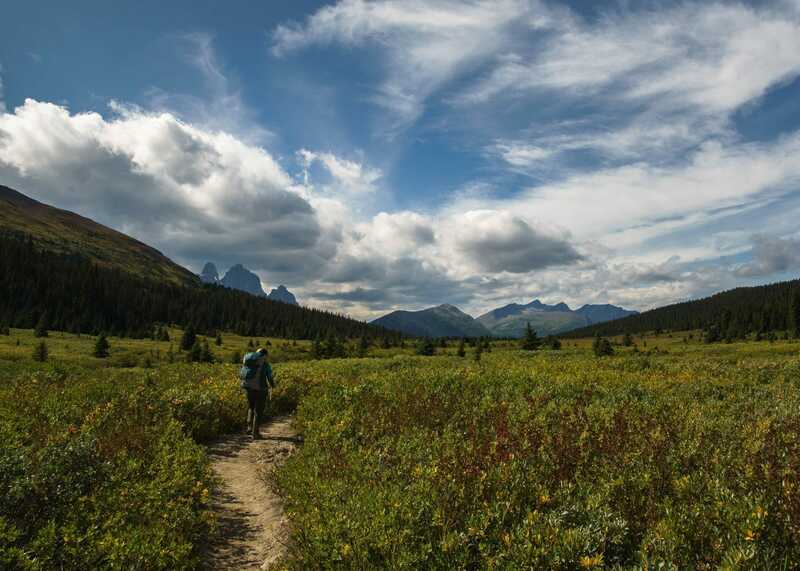 We consider ourselves so lucky to have areas like this so accessible to us and encourage all parks users to take an active role in maintaining the unmatched beauty of the Tonquin Valley. It’s the responsible tourism way and it’s the Zen way. Wow, your nature photography is really excellent! Take me there now please!! That moonrise picture is gorgeous!! Thank you! Might be a bit snowy right now though! This such a great detailed well-written article about one of the major hiking areas in Jasper National Park. I was just there in June and I missed the opportunity to see Jasper. I was one of the typical tourists being funneled into one of the major lakes. Thank you for all the wonderful insight about this beautiful valley. Thank you! Jasper will just have to be a reason to come back!